For all of us, we have been advised to get our hair cut every 6-8 weeks in order to nourish the hair. A hair cut is also essential in taming those split ends. Sydney, we do a pretty great job of keeping our ends neatly trimmed. The feeling of having two inches of your hair cut at first feels weird, yet it's an awesome feeling for your hair to feel invigorated all over again. No different to getting your hair coloured. Sydney, you know that we are home to some cheap hair salons. We're also home to some quality hair salons too. There is even a famous hairdresser known for charging $700 for a hair cut at his salon in Darlinghurst. Sydney, which hair salon do you go to for your hair care needs without a thought? Why? Love RAW Anthony Nader in Darlinghurst. Great, cheap hair colour services by their apprentices. 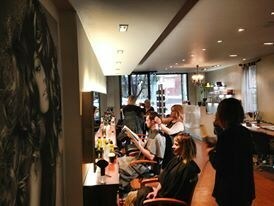 Excellent blow dry services too. You can get a first year apprentice do any of these for only $20 - toner extra. Sure it takes a little longer, yet in awesome ambience its all good. They're enthusiastic. Love the zen vibe in the wash basin area downstairs. For hair cuts, Just Cuts at Westfield Sydney and surprisingly good. For $35, you get a professional cut and wash. Blow dry is an extra $6 and you don't need to even make an appointment for the latter. I usually go to my local Hairhouse Warehouse. The staff are really friendly and the treatments very affordable. My local hair salon is amazing. I book an appointment at Hairhouse Warehouse in Warringah Mall (Westfield) without a second thought. Their service is professional, friendly and they go over and above to make you look and feel amazing.